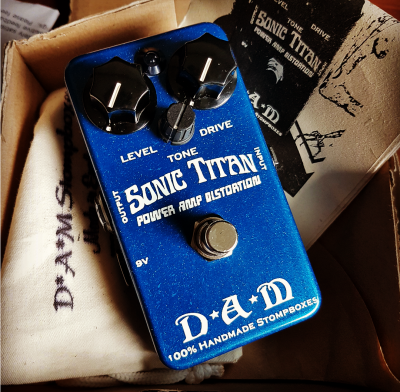 First up is a "Dark" tuned version of the mighty D*A*M Sonic Titan in a tasty starlight blue finish. Comes with original box, canvas bag, and papers. This isn't like your regular Titan. It is heavier and has a significant amount of gain. You won't get much clean sounds when you roll back the volume on your guitar. Perfect for big hard rock / heavy metal tones. Velcro has been attached to the back plate. Asking $285.00 shipped anywhere in the States. A bit more for folks overseas. 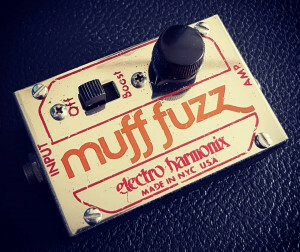 Up next is a very nice example of a electro-harmonix muff fuzz from the 70s. These may be tiny in size, but they pack a wallop in tone. Has some small cosmetic scuffs and scratches as expected from a used vintage unit. 100% fully functional.